Fur babies peek their snouts and paws through this adorable hand-knit bee sweater. Did you know bumble bees cuddle and give kisses, too? 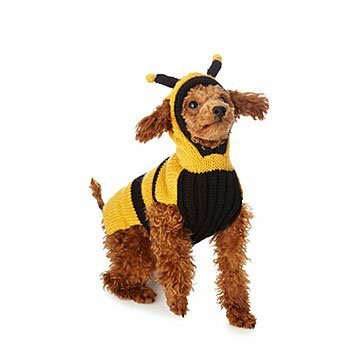 Just kidding, that's your sweet pup dressed in a bee sweater. Hand-knit by Peruvian artists Javier and Patricia Dam, this cozy costume keeps your fur baby warm and adorable for walks around the neighborhood, or just your nightly couch cuddle. Made from cotton canvas, the yellow stripes allow their snouts and paws to peek through for a darling social media share. Handmade in Peru.